Thank you for your continued support of Ayr RFC, Scottish Rugby’s BT Club of the Season. 2016/17 was another wonderful year, culminating in this prestigious award, and it would not have been possible without our members, and we can’t wait to see you back at the Millbrae for the start of this season on Saturday 26th August, when we play Melrose in the BT Charity Shield. We start our defence of our BT Premiership title on Saturday 2nd September away to Boroughmuir. It’s going to be an exciting year in Scotland’s top tier with Marr joining the party, and there’s already a buzz about our first meeting at Fullerton on Saturday 7th October and their visit to Millbrae on Saturday 20th January. We were sad to say goodbye as some squad members moved on, but I’m sure you will be looking forward to seeing our new players in action as part of our ever strong and enthusiastic senior squad. I wish the 1st and 2nd XVs and their coaching teams the best of luck for the league and cup competitions. Ayr Ladies continue to build their squad after an encouraging first year in the BT Premier League. Their Friday night matches at Millbrae brought a new dynamic to the rugby weekend, so please continue to support their fixtures. They start their season with an away game to Watsonians on Sunday 27th August. Our associate club Millbrae RFC are ready for the new season too, kicking off their year on Saturday 19th August with a BT West Shield preliminary round game against Lenzie. Ayr-Wellington Youth Rugby once again did the club and school proud, with trophies for the U15, U16 and U18 boys and U15 girls. More importantly, huge numbers of young people, from five-year-olds to eighteen-year-olds, have had fun, made friends and learned new skills through rugby. I thank all the parents, coaches and volunteers who work with the mini and youth rugby sections. Everyone at the club was excited to see Stafford McDowall and Robbie Smith play so well for Scotland U20s, as well as Gordon Reid, Ali Price, Mark Bennett and Finn Russell playing for the senior side, with D’arcy Rae touring with Scotland too. And there was great pride when Russell was called up for British and Irish Lions duty. Who from our current crop of players will be pulling on a dark blue jersey in future seasons? 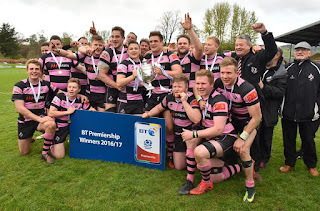 As ever, we are extremely grateful for the support of our sponsors, volunteers, fans and those who work behind the scenes at Millbrae to make Ayr RFC the best club in Scotland. Here’s to another great year! Sincere thanks, Billy McHarg, Ayr RFC president. It was another fun-filled year off the pitch at Millbrae as we expanded our social calendar and welcomed friends old and new. We had our first ever Oktoberfest, where we served traditional German beer and food to enthusiastic match-day visitors. Two staples in the local events diary of the Ayr RFC fireworks night and the Oval Ball in aid of the Ayr Community Rugby Trust were as popular as ever, with the latter once again raising vital funds so the trust can carry on taking rugby out into South Ayrshire for all to experience. We celebrated Scotland’s international matches with a buffet lunch at Millbrae before we safely got Ayr fans to Rugby Park in Kilmarnock for the national side’s entertaining autumn test with Georgia and back again in November, and a delicious Italian lunch in the clubhouse to mark the end of the Six Nations. The highlight of the year was undoubtedly Land O’Burns Weekender at the end of May. 350 tonnes of sand, 16 teams, 10 brewers and over 3000 visitors to Ayr RFC made the beach rugby and beer festival a weekend to remember. Whoever thought we would build a giant sandpit on the 1st XV pitch? We’ll be doing it all again in 2018, and we can’t wait to see you all again! Our social events are so important in bringing us all together, opening up the club to the community and letting our hair down after some tough rugby has been played by our men’s and women’s teams, and to see so many people enjoying themselves over the season has made all our social committee’s efforts worthwhile. We’ll see you, your friends and family in the clubhouse in 2017/18! Forging links with the business community gets more important with every season, as every season the club grows and thrives. We have built excellent ties with our loyal and dedicated sponsors from across all industries in the west of Scotland, and we are indebted to them for their service to the club. Ayr RFC is now a member of the Ayrshire Chamber of Commerce and Industry, further strengthening our business links across the county. Our members also play a vital role in the business aspect of the club, and not just by continuing with membership every season and attending games and social events, but by informing colleagues and business contacts of sponsorship opportunities at Ayr RFC. Live in Alloway and Doonfoot? Then why not make Millbrae your local? Our bar is open six days a week, Tuesday-Friday from 5pm, Saturday from 11am and Sunday from 1pm. We would especially like to see an increase in members attending pre-match hospitality. It's a fun, relaxed environment before every home game, with head coach Calum Forrester previewing the match, a delicious three-course meal, and a raffle, with the always entertaining Robbie Duncan leading proceedings. If you have friends and family visiting, please bring them along. It's £30 per person for our three-course pre-match lunch and entry to the game. Join us in the clubhouse afterwards to see the man of the match receive his award. Ayr Ladies’ made a well-earned move into the top tier of Scottish women’s rugby, the BT Premier League in 2016/17, and came up against some stern opposition throughout the year but did themselves and the club proud with a determined display week-in, week-out. After the initial round of fixtures, the league split in two, and Ayr were the over-all winners of Premier B, which the coaching team of Stuart Fenwick and Frazier Climo had set as the season’s goal. They reached the quarter-finals of the Sarah Beaney Cup and beat multiple league and cup winners Murrayfield Wanderers en route to the semi-finals of the Development Cup. The 40-24 away win against the big hitters from Edinburgh in February showed how far Ayr had come in a few months and that they could not only live with established Premier teams but beat them, and beat them well. Ayr Ladies captain Laura Turner is proud of the way the team rose to the challenge. Ayr Ladies have always thrived on a mixture of youth and experience, and the squad continues to grow and take shape for the future, with many players under the age of 21 turning out for the team last season. Kelsey Swift, Erin McSorley and Rachael Mulholland represented Scotland Students 7s, with Lauren Gunn, Joanne Jones and Catherine Shennan joining Mulholland in the West regional squad. Shennan, Turner and Emily Irving also took part in Scotland training camps. 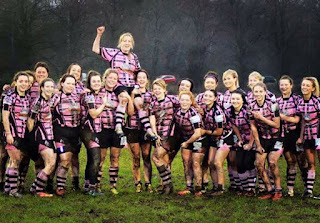 Shennan’s appointment as the Ayr Community Rugby Trust women’s and girls’ development officer has been a hugely positive step in the growth of the female game in the county, and her work with fellow coach Connie Griffiths with the Ayr-Wellington U15 girls has been particularly fruitful. The squad now boasts 25 young players, many of whom take part in Ayr Rugby Academy sessions. They were National Shield champions at BT Murrayfield in 2016/17, a fantastic achievement for the players, their parents and coaches. 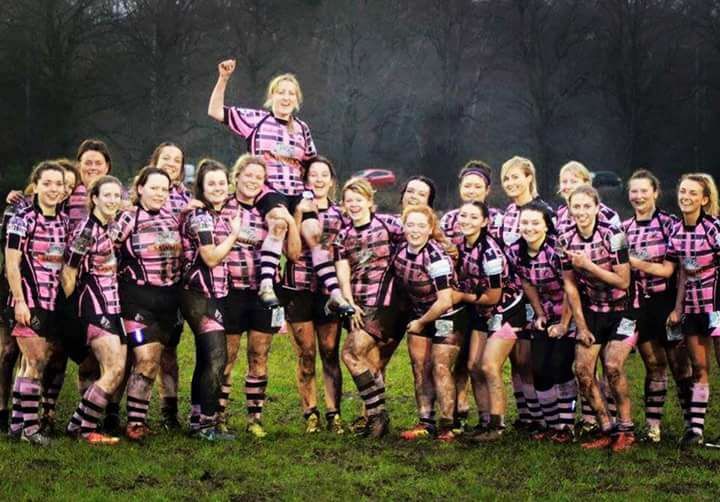 Ayr Ladies are always looking to recruit, so if you or someone you know would like to give rugby a go, get fit, make new friends and have fun, come along to training on Mondays, 6.30pm. 2016/17 was another successful year for the young men and women who are part of the Ayr Rugby Academy. The 40 academy members, as in previous years, take part in weekly sessions on skills, fitness, health and nutrition. This year, the U16 boys also had the benefit of media training with Laura Hamilton, who has worked in the field for a number of years. Laura took them through interviewing skills, how to present themselves on camera and how to conduct a press conference, as well as how to use social media responsibly. Although the academy is focussed on players getting the most out of their rugby experience, director Stuart Fenwick and his team of coaches are eager to provide the youngsters with transferable skills they can use in school, further education and employment. The academy members also have the benefit of working with Ayr 1st XV players, with Danny McCluskey leading the strength and conditioning sessions and club captain Pete McCallum an assistant coach. Last year was a hugely successful season for the club as a whole which culminated in the 1st XV being crowned BT Premiership champions after a hard-fought BT Premiership final victory away at Melrose. At the Scottish Rugby Club Awards, Ayr RFC was named BT Club of the Season 2016/17. This is the second time that the club has been awarded this in the last five years and it is a huge testament to the hard work that goes on behind the scenes from all the players, coaches, volunteers, parents, development officers and supporters. It is now key that we kick on and maintain our position at the top of Scottish club rugby. There are a few players that have moved on during the summer. A couple of faces will be returning in the not too distant future in different colours with Ross Curle and Richard Dalgleish joining Stirling County and Marr. Will Bordill and Archie Russell have moved down south for work and university respectively, whilst Craig Stevenson has taken the opportunity to head to Australia for a year after graduating from university. In addition, Scott Forrest and Jonny Stevenson have moved on following three seasons with Ayr, and on behalf of the whole club I would like thank all of the departing players and coaches for the effort they have put in during their time at Millbrae. Club XV: Pete McCallum (captain), Steven Longwell, Robert McAlpine, Blair Macpherson, Will Bordill, David Armstrong, Ross Curle. Scotland U20: Stafford McDowall, Robbie Smith. Scotland U19: Paddy Dewhirst, Harry Warr. Following their performances last season, Robbie Smith and Stafford McDowall have also earned full-time BT Sport Academy contract with the Glasgow Warriors. A new season brings some fresh faces to the club that have strengthened our squad. Robin Hislop and Tommy Spinks bring their professional experience to the squad alongside new BT Sport Academy recruits George Stokes, Robbie Nairn and Euan Mclaren. Jonny Agnew and Michael Badenhorst add competition to the second row, and Scott Lyle can slot in across the backline. The BT Premiership looks like it will be even more competitive this season. In addition to that, we have the added spice of an Ayrshire derby to look forward to in the BT Premiership for the first time, with Marr joining the league. The players have trained well during pre-season and we look forward to welcoming you all back to Millbrae on Saturday 26th August for the BT Charity Shield match against Melrose. Calum Forrester, Ayr RFC head coach. Please ensure you always bring your membership card to matches as stewards do not know all current members or you will be charged the standard entry fee. You will receive your 2017/18 membership card when you have paid your subscription. A season ticket for home games is again available from our bar steward Colin for only £45 (members only). This is valid for league and cup games, excluding play-offs. We intend to have all home 1st XV games kick off at at 3pm, but please check our website and social media if in doubt. Please ensure you purchase a match programme at least once. Articles on Callum Kerr's British and Irish Lions ambassador role, the Ayr-Wellington trip to France and the best tries of last season feature, as well as George McMillan's fantastic photos. Make sure you follow us on Facebook (ayrrugbyclub), Twitter (OfficialAyrRFC) and Instagram (ayrrfc).